Sign ups are open. Click here for link. ****** WE WILL NOT BE USING OUR ONLINE CALENDARS THIS YEAR TO SIGN UP!! We will be using their system. ***** Sign-up Link: http://signup.com/go/gzmcbMUWhen you sign up, the form will ask you for your “Local Chapter” — put GSA in that spot. On their page, if you click the circles with initials of those who signed up, you can see their name.You can sign up for the March 7 orientation on the same page. 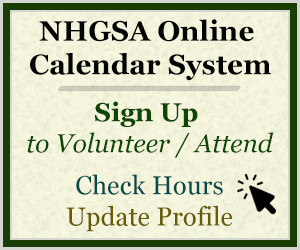 You will receive one hour credit for attending.Come help out at New Hampshire’s longest running home show on March 8, 9, 10, 2019The NH Home Builders Association has asked the GSAs to help out again this year at their 52nd annual NH State Home Show. The NH State Home Show is HUGE! They filled the Expo Center, Ballroom and Armory room at the DoubleTree Downtown Manchester with more than 320 booths last year. Exhibits range from typical home show fare (builders, designers, furniture, etc.) to NH and New England crafts and food. The event also features a Lego building contest for kids, and seminars for consumers on building and remodeling.All Granite State Ambassadors and Future Leaders of NH are welcome to sign up for shifts. Friday, March 8: 1 – 8 p.m.
Saturday, March 9: 10 a.m. – 6 p.m.
Sunday, March 10: 10 a.m. – 4 p.m.
Home Show attendees can get discounted parking in the garage ($6) by having their tickets stamped at the information booth in the South Hall (Expo Center) or at the NHHBA booth in the North Hall (Armory room). Home Show management have generously offered to cover parking costs for GSAs who wish to park in the garage for their shifts. If you’re familiar enough with the area, please consider parking on street on Saturday and Sunday when it’s free, as parking for 50+ people at $6 each can get pretty expensive. On street parking is free on Saturday (everywhere except Elm St.) and everywhere on Sunday. There are also a number of parking lots nearby, including the lot behind TD Bank between W. Merrimack and Middle Streets, that are free on Saturday and Sunday. Show management is asking that if volunteers, exhibitors and staff must park in the garage that they park on the top level, to create more space for attendees. If you do park in the garage, bring your ticket in to be stamped. Ticket Sales & Wrist Bands (2 positions): Greet patrons coming to the show, take payment, and put on wrist bands. Traffic/Security: Check for wrist bands and help direct guests. Exhibitor/Vendor Check-In: Assist exhibitors with the touch screen computers to print out their badges. Exhibit Hall Floater/Support: Walk through exhibit halls, helping out guests and exhibitors where needed. Popcorn Booth: Help run the popcorn and coffee makers, and sell concessions to guests. Lego Competition: This position is for the Lego Competition. Duties will include: checking competitors in, setting up the tables, helping the competitors, and clean up after the competition. Saturdays event is for children ages 5-7. Come early or stay after your shift to see the show! Shifts at the Home Show count towards the event shifts necessary to receive the Indian Head Perk. An in-person orientation is scheduled for March 7, 11am at the DoubleTree Downtown Manchester Hotel (formerly known as the Radisson). If you are able to attend, please do. This meeting will give you a chance to scope out the lay of the land before your shift, and give show management a chance to meet you. Event orientations count as volunteer service hours. No large bags or purses, fanny packs are OK. When layering for warmth, please try to put layers under your uniform shirt, and avoid vests/jackets/scarves that cover up your uniform. Please expect to be standing for most of your shift.